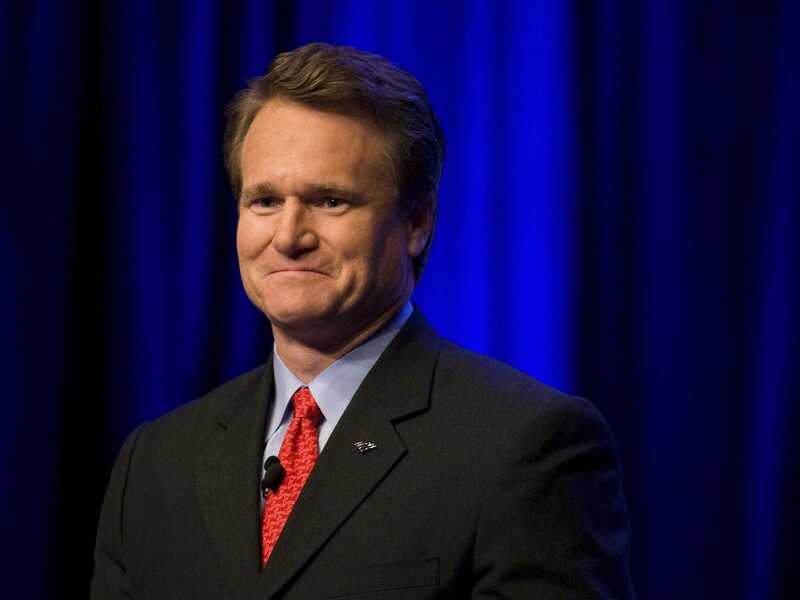 Bank of America has revised down its third quarter earnings by $US400 million amid a currency probe that has forced it to add to its legal reserves. The bank had reported a loss of 1 cent share last month, with a net income of $US168 million. Revenue came in at $US21.4 billion. Analysts had expected it to be worse, with a loss of 9 cents a share. This downward revision puts the bank at al oss of 4 cents a share and takes their net income down to a loss of $US232 million. Citi also revised down its earnings to boost legal reserves. In a government filing, JP Morgan said that its upcoming legal issues could cost it between 0 and $US6 billion. CHARLOTTE, N.C.–(BUSINESS WIRE)–Nov. 6, 2014– Bank of America Corporation today announced an adjustment to its financial results for the third quarter ended September 30, 2014 to include additional litigation expense related to its foreign exchange business. Subsequent to the company’s earnings announcement on October 15, and prior to the filing of the company’s Quarterly Report on Form 10-Q for the quarter ended September 30, 2014, the company has been engaged in separate advanced discussions with certain U.S. banking regulatory agencies to resolve matters related to its foreign exchange business. As a result of those discussions, the company recorded a $US400 million non-deductible charge and adjusted its third-quarter 2014 financial results to a net loss of $US232 million or $US(0.04) per share. There can be no assurance as to the ultimate outcome of these matters. The company’s Quarterly Report on Form 10-Q, which is being filed today with the U.S. Securities and Exchange Commission, will reflect the adjustment. These statements are not guarantees of future results or performance and involve certain risks, uncertainties and assumptions that are difficult to predict and are often beyond Bank of America’s control. Actual outcomes and results may differ materially from those expressed in, or implied by, any forward-looking statements. You should not place undue reliance on any forward-looking statement and should consider all of the uncertainties and risks discussed under Item 1A. “Risk Factors” of Bank of America’s Annual Report on Form 10-K for the year ended December 31, 2013 and in any of Bank of America’s other subsequent Securities and Exchange Commission filings. Bank of America is one of the world’s largest financial institutions, serving individual consumers, small businesses, middle-market businesses and large corporations with a full range of banking, investing, asset management and other financial and risk management products and services. The company provides unmatched convenience in the United States, serving approximately 48 million consumer and small business relationships with approximately 4,900 retail banking offices and approximately 15,700 ATMs and award-winning online banking with 31 million active users and more than 16 million mobile users. Bank of America is among the world’s leading wealth management companies and is a global leader in corporate and investment banking and trading across a broad range of asset classes, serving corporations, governments, institutions and individuals around the world. Bank of America offers industry-leading support to approximately 3 million small business owners through a suite of innovative, easy-to-use online products and services. The company serves clients through operations in more than 40 countries. Bank of America Corporation stock (NYSE: BAC) is listed on the New York Stock Exchange.